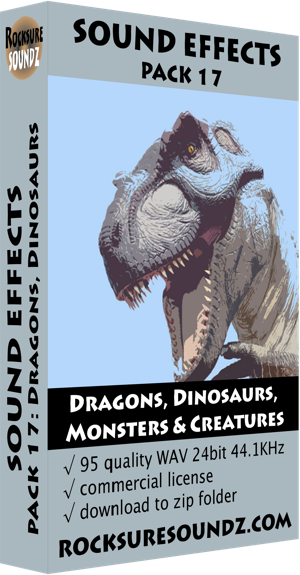 Sound Effects Pack 17 Dragons, Dinosaurs, Creatures & Monsters: This pack contains the screeches, growls and roars of mythical beasts and ancient giant reptilian monsters. Take a trip into their mystical world through the sounds found in this collection. All sfx were recorded with high quality microphones and analog recording equipment, and are presented here as a zip of 24 bit/44.1kHz wav files.